Our Jumbo Bin is a reliable, sustainable and profitable plastic alternative to the wooden bin traditionally used in the agricultural industry. 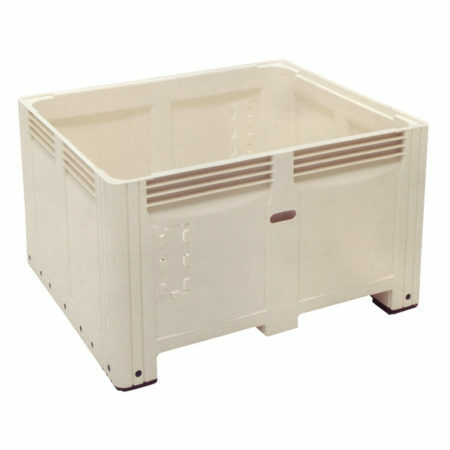 It is considered by many to be one of the best quality bulk bins in the world. Rounded corners and smoother interior surfaces result in less bruising and damage to fresh produce. 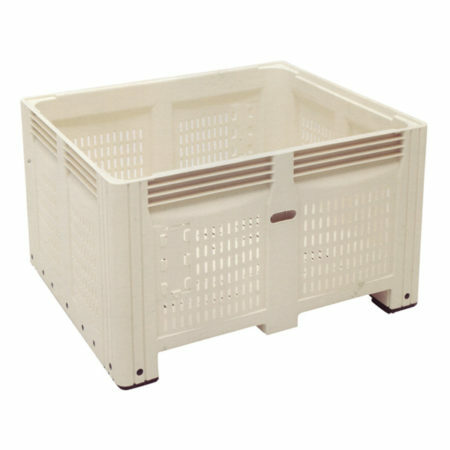 Vents provide superior air flow, adding valuable shelf-life to fresh produce. Smooth, nonabsorbent surface is not affected by dipping operations. The design is compatible with most bin handling equipment. Unique moulded label holders for cards and tags. Easy, clear ownership identification with hot foil stamping. Comfortable hand holds are built for easy lifting and handling of bins. The positive interlocking foot design permits fast and safe stacking. Ventilation slots: 804 air vents with 8 mm or 3 mm vent opening. 4700 kg on level ground in cold storage. 3800 kg on level ground in temperatures less than 35º C, for less than one month. 3400 kg on level ground at temperatures less than 35º C, for more than one month. Brochure: Please download our brochure or view and order our products online from the list below.